Home > Economics Of Solar > Will LGCs Pay More Than STCs on a 10-100kW solar system? Will LGCs Pay More Than STCs on a 10-100kW solar system? There are 2 subsidies for solar under 100kW: STCs (AKA the ‘solar rebate’) and the lesser known LGCs. Which one will give you the better return? Update 23rd Feb 2018: Solar installations of 100 kilowatts or less now only receive STCs. However, applications made before March 31st 2018 for systems of 10 to 100 kilowatts may be accepted under the old rules and permitted to receive LGCs. 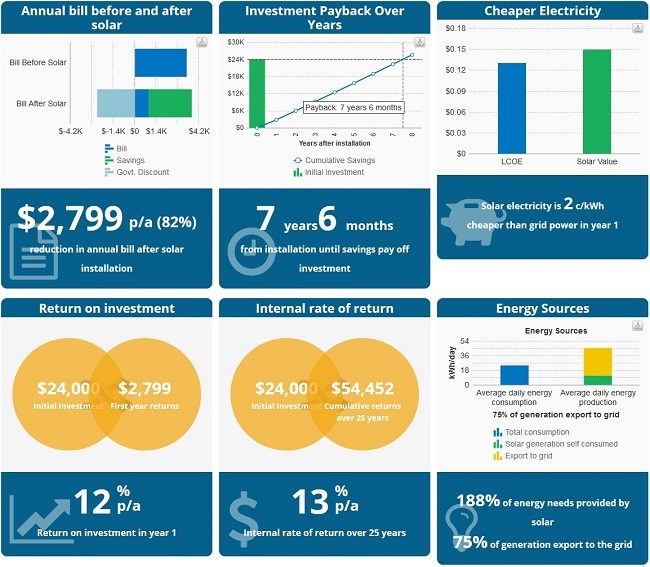 Many people are aware the Renewable Energy Target, or RET, lowers the cost of rooftop solar. This is often called the solar rebate, even though that term is not entirely accurate. But what few people know is, provided their system is large enough, they have a choice in the type of assistance they receive. A household with a 10 kilowatt rooftop solar system can either accept Small-scale Technology Certificates (STCs) or Large-scale Generation Certificates (LGCs). Almost all solar systems 100kW and smaller, currently being installed use STCs because they are all deemed immediately after the installation whereas LGCs are deemed annually over 15 years. At the time of writing (July 2016) STCs are $38 each whereas LGCs are at a sky high $82. This has made some savvy solar installers wonder if using LGCs instead of STCs might create a better return for patient solar owners. Using a neat bit of software called PVsell I investigated if a 10 kilowatt rooftop solar system in a best case situation could come out ahead economically by accepting LGCs for electricity produced instead of STCs. I also checked the PVsell results by estimating the total value LGCs that could be earned and comparing it to what STCs plus interest would be worth over that time. The results indicated accepting LGCs instead of STCs is not likely to be worthwhile for most people. If LGCs were to stay at their current, sky-high prices for most of the next 15 years, the return would certainly be better. But I believe this is highly unlikely. Although you can buy LGC contracts out to 2020 at $82, my prediction is that the LGC price will fall substantially after 2020. So my personal recommendation is to stick with STCs. To discover my reasoning, please read on. What The Hell Are STCs? STCs are pieces of paper created when a household installs solar PV, solar hot water, or other small-scale renewable generating capacity. Except for the fact they are not actually pieces of paper. But despite the inability to doodle or blow your nose on them, they are just as good as paper certificates even though they are entirely digital. For rooftop PV households currently receive one STC for each megawatt-hour of electricity their system is estimated to produce over the next 15 years. A megawatt-hour is equal to 1,000 kilowatt-hours. These STCs are received upfront and can immediately be turned into cash if desired. While people can personally handle STCs their rooftop solar creates, the very large majority of people choose to allow their installer use them to lower the cost of their system. How much electricity a rooftop solar system will generate is affected by its location and orientation, but STCs only take location into account. Australia is divided into four zones for solar PV with zone 1 one being the most sunny and zone 4 the least sunny. 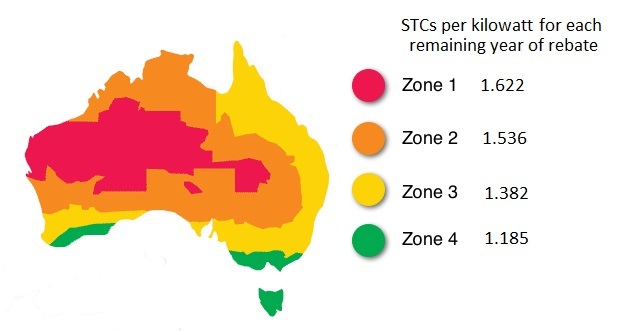 The lower the zone number the more STCs will be received for each kilowatt of rooftop solar. By far the largest number of Australians live in zone 3 as it includes Brisbane, Sydney, Adelaide, and Perth. The solar rebate zones and how many STCs you get per kilowatt-hour of solar panels for each remaining year of the solar rebate. The direction panels face affects how much electricity they generate with those facing west or east producing around 12% less than north facing ones, but this does not affect the amount of STCs received. It is instead simply assumed that because people have an incentive to use them sensibly they won’t normally do things such as install solar panels in areas of permanent shade or upside down. Currently one STC is worth $38.50 but their price fluctuates with supply and demand. Since they were first introduced at the start of 2011 their value has averaged around $35. This comes to roughly 3.5 cents per kilowatt-hour of electricity. What System Sizes are Eligible For STCs? Solar PV systems of up to 100 kilowatts in size can receive 15 years worth of STCS for the zone they are in, provided they are installed this year. Larger systems can either accept LGCs or nothing. Systems smaller than 10 kilowatts can only accept STCs. What The Hell Are LGCs? New large-scale renewable generation capacity can receive one LGC per megawatt-hour generated. However, there is some flexibility with just what is considered to be large-scale. While massive 3 megawatt wind turbines and 102 megawatt solar farms definitely count as large-scale, a rooftop solar system as small as 10 kilowatts can receive LGCs rather than STCs if desired. Since the start of 2011 when STCs were introduced, LGCs have averaged around $44 each. But they have been rising since the start of 2015 and are now at a record high of over $82 which comes to more than 8.2 cents per kilowatt-hour generated. In order to receive LGCs you must send electricity meter readings showing your renewable energy production to the Renewable Energy Certificate Registry. You will have until the end of the next calendar year to claim LGCs for renewable electricity you generate. The time and effort required to keep track of your generation and claim LGCs is a cost I have not included in the calculations below. But it is something that should be considered, particularly if the economic advantage of using LGCs rather than STCs is expected to be small. STCs and LGCs have value because electricity retailers need to surrender a certain number of them each year as part of the Renewable Energy Target to prove the amount of renewable energy generation is increasing. If they don’t hand over the required number they are forced to pay a penalty, so they are willing to pay money for them. When a lot of rooftop solar is being installed many STCs are created and if electricity retailers have bought enough to cover their immediate needs demand will fall and their price will drop. A similar situation applies for LGCs. Very little large-scale renewable generating capacity has been built in Australia over the past couple of years and so the price of LGCs is now very high. The RET is being phased out and will come to an end on 31st of December 2030. LGCs can only be created up until that date. Currently rooftop PV receives 15 years’ worth of STCs upfront, but that will be reduced by one year on the first of January every year, starting in five and a half months’ time. This means new systems installed this year can still receive the full amount of STCs, but systems receiving LGCs that have their installations competed immediately can only receive LGCs for the next 14.5 years. Almost everyone prefers to have a fistful of money now rather than the promise of an identical fistful of money in the future. So it is reasonable to expect LGC prices to be higher than STC prices since STCs can be turned into cash immediately instead of having to wait for one megawatt-hour of renewable electricity to be generated to receive one LGC. But because the two certificates are traded separately their values can vary significantly. When STCs were first introduced at the start of 2011 they immediately became more valuable than LGCs. For a few months. Then they fell to half the LGC price. Two years after that they were worth more than LGCs and remained that way until a year and a half ago. For the past three and a half years they have been fairly steady at around $38. Currently LGCs are at their highest price ever at over $82. I mentioned that almost everyone prefers money now compared to a promise of the same amount of money later. One major reason for this is because the promise may turn out to be a load of fetid dingo kidneys. The Coalition government has made it very clear it wishes to destroy the Renewable Energy Target. In June last year they cut the total amount of clean energy it will provide by 20% and now they have won the federal election they may try to eliminate it. It is very unlikely they would stop a renewable energy system currently getting LGCs from receiving ones it is entitled to in the future. This is because it would be economic madness for the Coalition to damage the credibility of the Australian government in that way. They would have to be completely irresponsible to even consider it. So what I am saying is, there is a chance they will do it. However, it does seem very unlikely. Even though the Coalition is now weaker than it was, it is still possible they will attempt to reduce or eliminate the RET for new renewable generating capacity. But I think the chance of them stopping LGCs for existing capacity is less than 1%. After all, some very large companies receive LGCs and the Coalition is always on the look out for the welfare of that delicate and vulnerable portion of our society. STCs also could be eliminated by the Coalition, although the risk there is different. Because STCs are received up front, once either you or your installer has turned them into cash the risk is pretty much gone. Even the Coalition isn’t going to knock on your door and ask for your STC money back after you’ve gotten it. They’ll just charge you a sunshine levy instead. The amount of STCs given varies according the zone they are installed in, but a system receives LGCs according to how much renewable electricity it generates, so for LGCs to have a chance of being superior to STCs the system will have to generate as much electricity as possible. That means it will need to face north and have as little shading as possible. Also, in order to get the most favorable comparison between LGCs and STCs, it should be in a location that receives a higher than average amount of sunshine for the zone it is in. For example, identical north facing systems will receive the same number of STCs in the zone 3 cities of Sydney and Brisbane, but the one in Brisbane will generate around 9% more electricity. But I will not use a location in Queensland as an example, as unfortunately their network operators make it very difficult in practice to install 10 kilowatt systems. Fortunately, I happen to know an extremely sunny location within Zone 3 in a state where people are still free to experience the heady rush that comes from installing 10 kilowatts of solar power. That place is Whyalla in South Australia. It is the state’s third largest city with a population of over 22,000 and is only 4 hours and 15 minutes drive from Adelaide. My aunt Bernard lives there and, besides her, the town has almost no major flaws at all. Apart from a massive skin cancer rate. According to PVWatts a 10 kilowatt, north facing, rooftop solar system in Whyalla is capable of producing 17.25 megawatt-hours of electricity a year. With a loss of output due to panel deterioration of 0.4% a year, which is not unreasonable for quality solar panels, it should average around 16.75 megawatts a year over the 14.5 years. This will give a grand total of 243 LGCs if it is installed immediately. Alternatively, as it is in zone 3, the system could receive 207.3 STCs if it was installed any time this year and 193.5 STCs if it was installed in 2017. Whether or not getting LGCs will be more worthwhile than STCs depends on what they will be worth in the future. At the moment their value is over twice that of STCs and that seems likely to continue for some time, as it is currently possible to contract a price of $82 for LGCs for the next four years. Without a contract the price is likely to stay high over the next four years, but there is no guarantee it will. As for what they will be in 10 years’ time, any predictions will be little better than wild stabs in the dark. Because it is very difficult to know just what will happen to certificate prices, I will consider two different possibilities. First I will look at what happens if the average value of LGCs and STCs are the same. And then I will work out the average LGC price required for them to be as worthwhile as STCs. In order to work this out I entered the details of the system and certificate prices into PVsell. If what I am writing seem like an advertisement for PVsell, don’t worry, it’s not. I’m not getting any money for it and neither is anyone at SolarQuotes. What did happen was, Warwick Johnston, the Managing Director of SunWiz Solar Energy Consulting, or as I think of him, the PVsell guy, offered to let me use PVsell for free. So I’m using it. I’m too lazy not to. Trust me, I wouldn’t be writing this article if I had to do all the calculations by hand. I entered the details of a 10 kilowatt, north facing rooftop solar system in Whyalla into PVsell to see whether it would be more worthwhile to receive LGCs or STCs. For the cost of the system I entered $2.40 a watt. This figure is slightly above the average for a large system in South Australia as I want it to be a reliable system with good quality components. This makes the price before the 10% GST is applied $2.18. Note the cost of the system has not been reduced by STCs. I also assumed it belongs to a large family with a high average electricity consumption of 24 kilowatt-hours a day. I have assumed that inflation over the next 14.5 years until the end of the RET will average 2% and that LGC prices and grid electricity prices will increase by that amount each year. If grid electricity prices change by a different amount it can affect the payback time and return on investment of the system, but it won’t change whether STCs or LGCs are more worthwhile. 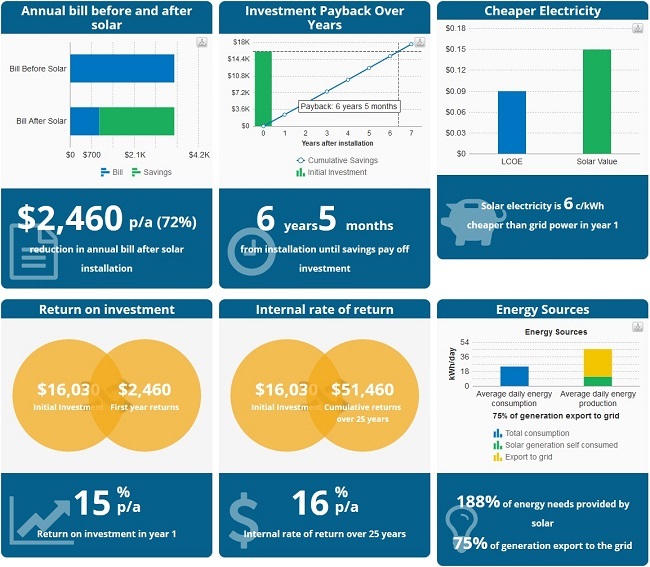 PVsell provides a considerable amount of information on a rooftop solar systems, including electricity bills before and after the system is installed, its payback time, how much cheaper solar electricity is, the rate of return on the investment, and what percentage of solar electricity is exported. What PVsell tells me about using STCs for a 10 kilowatt, north facing system in Whyalla. As you can see, with STCs the system is expected to pay for itself after 6 years and 5 months and provide a 16% return on the investment over 25 years. PVsell shows that if the system uses LGCs the payback times will increase by 13 months to 7 years and 5 months and the return on investment falls from 16% over 25 years to 13%. So even in an ideal situation, rooftop solar systems that accept LGCs cannot come out ahead if they have the same average value as STCs. By altering the LGC prices I entered into PVsell, I discovered they needed to average around $33 higher than STCs to give the same economic benefit. Currently LGCs are worth over $43 more than STCs, but it is not possible to be certain they will stay that high. If, against all reason and possibly the will of the gods themselves, LGCs not only remain at their current high price of over $82 and increase by 2% a year until they hit their maximum ceiling price of $93 after six and a half years, then according to PVsell the system would pay for itself in 6 years and 2 months. That’s an improvement over STCs at their current price, but because LGCs reach their ceiling price and can’t go any higher, even in this extremely optimistic scenario the rate of return on the investment over 25 years does not go over 16% and so is not a large improvement over using STCs. My mildly educated guess is a lot of large-scale renewable capacity will be built over the next few years. This is because I think it is likely the electricity sector has been waiting for two things. Firstly, large-scale solar has been falling rapidly in price in Australia and around the world and may soon be cheaper to build here than wind power. And secondly, they have been waiting for this federal election. Now that the Coalition has been returned, major companies such as AGL and Origin will wait and see if the government signals it intends to reduce or eliminate the RET. If they don’t receive that signal, which they may not now the Coalition has been weakened, they will start building new renewable capacity. If the Coalition does indicate they will continue their attack on the RET these companies will wait to see the outcome before they do anything. If the RET remains in place I think it is likely that LGC prices will fall, although probably not until 2020. It is possible that from now until the end of the Renewable Energy Target in 2030 LGC prices will average $33 or more than STC prices. But it would be a major gamble to rely on that, as it has only been the case for 8 months out of the 66 that STCs have been in existence. In order to check the PVsell results I performed a simple back of the envelope calculation which compared the amount of money LGCs would total over the 14.5 years they can be earned to the amount of money STCs plus interest would total after that period. In other words, if you took STCs and turned them into cash and invested it, would you end up with more or less money at the end of 2030 if you were earning LGCs for all that time? The most important consideration for this sort of calculation is just what interest rate the STCs will earn. A figure of 5% is often used for these types of calculations. This is not appropriate to use for everyone, but I will stick to it for now and consider what effect a lower interest rate will have later. To simplify calculations I will perform them in today’s money. This means I won’t take inflation into account. Today the STCs for a 10 kilowatt rooftop solar system in zone 3 are worth a total of $7,969.50. After earning 5% interest for 14.5 years that would come to a total of approximately $16,170. After taking panel degradation into account, a 10 kilowatt north facing system in Whyalla could potentially produce an average of 16.75 megawatts a year. That comes to 243 megawatt-hours over 14.5 years which will give an equal number of LGCs. If the average price of LGCs is equal to the current price of STCs at $38.50 their total value will be $9,356 dollars. Less than half what the STCs would be worth. However, since the money earned from LGCs can also be invested they will earn interest for, on average, half the time the STCs will. This will boost their total value to around $13,385. This is still well below the value of the STCs and so STCs are clearly the better option. If we assume that the price of LGCs averages $10 dollars higher, the total value of the LGCs over 14.5 years will become $16,860. So at an average price of $48.50 for LGCs they will have a small advantage over STCs. While these results agree with PVsell that if STCs and LGcs average the same price STCs are the superior choice, the back of the envelope calculation indicates that LGCs only need to average around $10 more rather than $33 for LGCs to become worthwhile. This makes me suspect PVsell may be using an effective interest rate that is greater than 5%. I used a 5% interest rate to check the PVsell results, but for some people a lower rate would be more suitable. The lowest interest rate that would be appropriate to use would be for people who have nothing better to do with their money than keep it in term deposits. And by nothing better I mean they don’t have a home loan or other debts to pay off and they are not interested in investing in the share market, bonds, property, or my Brooklyn Bridge Equity Fund. Currently term deposits earn around 3% interest, but because I am not adjusting the results for inflation, the real return after inflation should be used instead. Over the past 10 years the real return on term deposits has been around 2%, so I will use that figure. With a 2% interest rate and their current price of $38.50 the STCs for the system would be worth $10,620 after 14.5 years. If LGCs average the same price then after that time and earning their own share of interest they would be worth a total of $10,810. While the difference isn’t large, LGCs come out just ahead. While I can’t predict what will happen to LGC prices, it is not at all unreasonable to expect them to average the same or higher than STCs, especially since they are expected to remain over $82 for the next 4 years. Therefore, people who would otherwise leave their money sitting in a term deposit could definitely come out ahead by accepting LGCs rather than STCs. While I used the example of a 10 kilowatt system, the conclusions about which type of certificate would be most worthwhile hold true for any system up to 100 kilowatts, which is the largest size which can still receive STCs. Larger ground mounted systems are now often installed with tracking systems which improve electricity output by making the solar panels follow the sun. This increases the number of LGCs that will be created but the additional cost of trackers must be accounted for, so it is not clear systems with tracking will favor using LGCs. People who only invest money in term deposits may find themselves better off accepting LGCs rather than STCs. However, not many Australians are in this category and the PVsell results appear to reflect this. It seems clear the large majority of people would be better off with STCs for PV systems from 10 to 100 kilowatts, even for a system in an optimal location. This conclusion is supported by both the PVsell software results and the simple, back of the envelope, comparison I did to compare the total worth of STCs and LGCs after a 14.5 year period. Previous Article: Canberra reshuffle: Mr Coal gets the job but is it all bad news?